Turquoise & Black Jade & Turquoise Inlay BEAR Pendant! 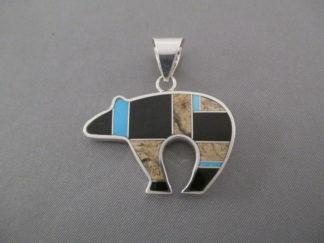 This sterling silver bear pendant features inlaid Kingman Turquoise, Ithaca Peak Turquoise, and Black Jade stones. Can also be reversed to be worn as a sterling silver bear pendant with heart-line. Made by Native American jewelry artist, Peterson Chee (Navajo).